Would you be a teacher? Hekia Parata says that teaching needs to be higher on people’s preferential list of jobs, and I agree with her. I am unclear, though, how treating teachers like miscreants that need rules, rules, rules to keep them in place, and forcing teachers to use practices and systems they do not agree with (and which know research does not support) makes teaching something job-seekers would put high on their list. A teacher’s starting pay can be as low as $35k. A quick look through Seek today shows basic admin jobs paid at $20/hour, which works out at over $41k a year. For basic admin. It hardly puts the job up there with lawyer or doctor in the status stakes, does it? 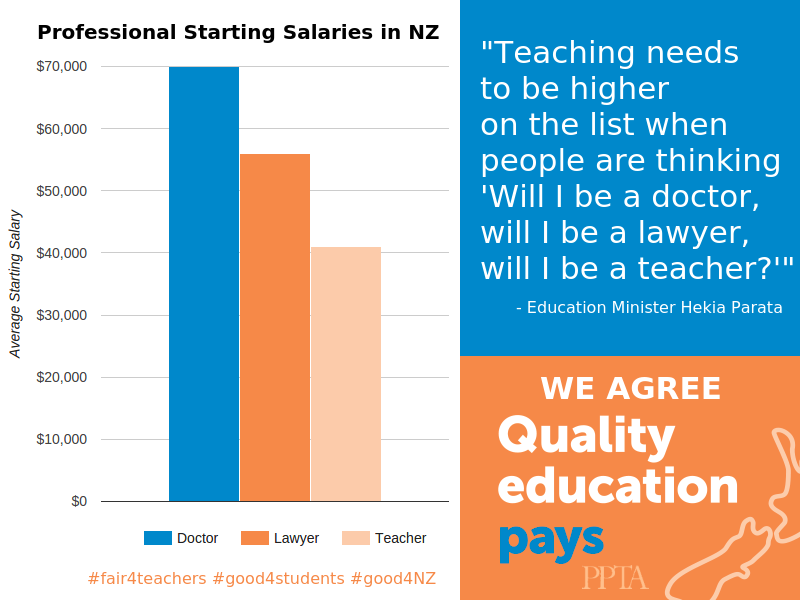 If Hekia is serious about her wish for people to think of teaching as a high status profession, and this isn’t just rhetoric, then she has a lot of work to do to redress the damage already done and ensure teachers are paid, treated and seen as the professionals they are.